Rodrigo y Gabriela, the Mexican guitar duo composed of Rodrigo Sanchez and Gabriela Quintero, have been quiet since their last album, 9 Dead Alive released in 2014. The two are known for cutting their teeth in metal and hard rock before blending their chops with a nueva flamenco sound that eventually found its way to American listeners and even Hans Zimmer soundtracks. They absolutely shred in live and studio performances, with Rodrigo playing leads and Gabriela playing literally everything else on her single classical guitar. Back to that in a bit. Given their background, it’s appropriate that Rodrigo y Gabriela released a cover of Pink Floyd’s “Echoes” – one of the hit songs from their self titled sophomore effort was a cover of Led Zeppelin’s “Stairway to Heaven,” after all. “Echoes” is a sprawling, 20 minute epic poem of a song on Floyd’s Mettle. The original still stands out as a landmark piece of classic rock history, but Rodrigo y Gabriela’s reimagining of “Echoes” is something else entirely. The first notes of the tune grip you instantly. Rodrigo plucks the cleanest, crystal clear note high up on the neck of his guitar, twice. It sounds like a bird call in a pristine mountain valley. A bit of freeform prelude in this pastoral space, and then Rodrigo y Gabriela start to rip things up. Now, without vocals, drums, or bass to back them up, the pair have a lot of space to fill out. They accomplish this flawlessly. While the two are greater than the sum of their parts, Quintero stands out as a singular force in “Echoes.” Not only does Quintero play chords – with a rapid finger technique known as the rasqueo – but fills the rhythmic and percussive space for the entire 20 minutes of the tune as well. Listening to such a skilled guitarist bring a brilliant new energy to a well trodden, deeply influential song should be a reminder that there’s life in rock yet. That’s not to disparage Rodrigo, of course. As a lead guitarist he’s got ground to cover himself, recreating not just the lead guitar parts of “Echoes” but the spacey vocals as well. Rodrigo’s playing interpolates the psych rock origins of “Echoes” through the flamenco lens. Melodic lines sound more emotional than the original, phrases somehow have more sonic depth despite the stripped down instrumentation. Part of this is the timbre of classical nylon stringed guitar, but far more of it comes from Rodrigo’s expressive playing. Every string bend is a mournful cry, every arpeggio shimmers in summer moonlight. This stripped down instrumentation also frees Rodrigo y Gabriela up to make some interesting creative decisions that fuller bands either can’t or don’t make. For instance, around the 9 minute mark, the pair drop out of a simmering vamp into a swimming, bassy cooldown section before the sound drops out altogether. In the original, the next section hits you with all manner of harsh electronic ambiance, like musical nihilism. 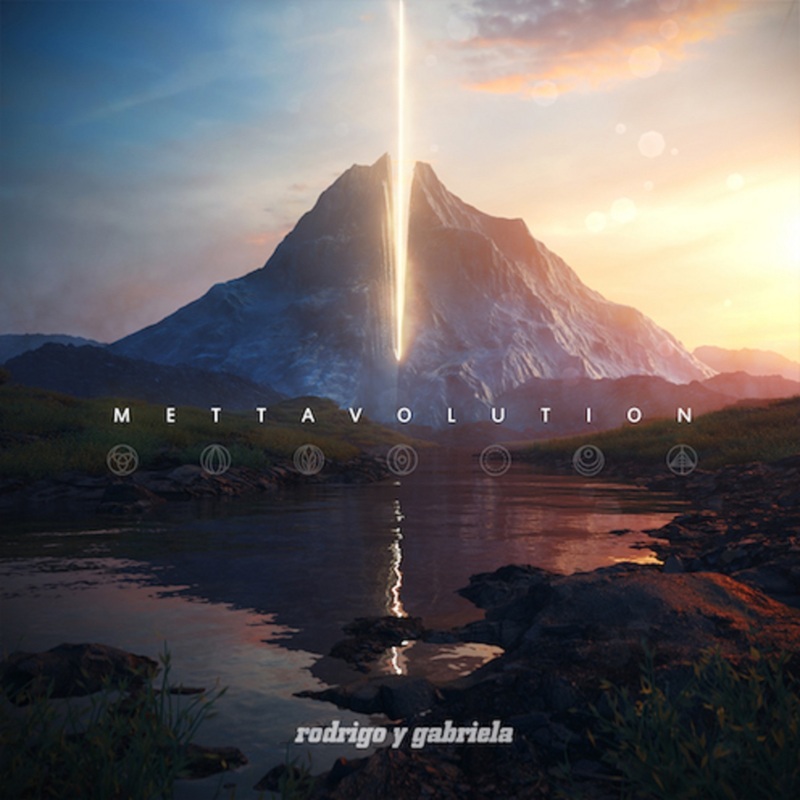 What Rodrigo y Gabriela choose to do with this section – which for obvious reasons they can’t emulate – represents what RodGab can do with just two classical guitars and a profound knowledge of their instrument. Bass heavy percussive slaps on the frame of the guitar, string scratching that sounds like a train chugging, cathedral reverb along dissonant notes all build in this great slow burn section that at once sounds deeply peaceful but forebodes a coming explosion. The pair take their time with it too – this space lasts for nearly four minutes before pummeling into a ferocious steel-stringed crescendo and vaulting into Rodrigo’s breathtaking solo. Rodrigo y Gabriela’s mastery of dynamics makes other music sound flat by comparison, though their instrumentation practically necessitates it. Couple this with the tactile effects around the middle of the song and their “Echoes” is truly theirs. “Echoes” is set to appear on their upcoming Mettavolution, releasing April 26, 2019 via ATO Records. It will be their first studio effort since 9 Dead Alive in 2014, so expect great things from this singular guitar duo!